Hostnet Review 2019: Is Hostnet a Good Hosting? Serving more than 1000 customers worldwide, Hostnet is a leading Latvian web host and domain registrar that provides personalized solutions and powers more than 2,000 domains and websites. Latvian company Hostnet was founded in 2006 with the aim of providing customers with individualized web hosting solutions. Through years of continually improving its services and infrastructure, Hostnet has become a reliable and secure web host for some of the biggest names in Latvia. Its servers are housed in secure facilities in Riga, Moscow, London, and Berlin, and its website is available in six languages. Hostnet gives users access to the powerful and user-friendly cPanel and Plesk control panels. Using the free site builder, it should only take a day or two for a rookie webmaster to create a website complemented by databases and personalized emails. Hostnet’s e-commerce-ready plans make it equally easy to set up an e-store with a product inventory, shopping cart, and secure payment gateway. Everyone dreads data loss, as I know only too well, so it’s nice to see Hostnet’s continuous data backup and fast recovery options. But prevention is better than cure, so Hostnet’s servers are housed in a secure facility with 24/7 monitoring. SSL certificates are provided for customers who want an extra layer of security for their websites and web applications, and I also encourage you to password-protect your directories and enable anti-spam protection on your webmails. Hostnet offers its customers a number of hosting options with four billing cycles: one month, six months, and annual subscriptions. Prices are not far off those of the key players in the hosting market, and you also get a 30-day money-back guarantee that can get you out quick if it all goes wrong. Scaling up is as easy as paying the difference between your previous plan and your new plan, and it’s all automated, so you probably won’t need to ask for assistance. 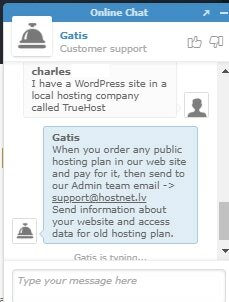 Before asking for help, you might first refer to Hostnet’s FAQs. Hostnet comes across as a company that has the knowledge, experience, and facilities to cater to the diverse needs of all users; from the beginner who wants simple hosting to enterprises that want dedicated servers. Wondering how Hostnet stacks up against other Web Hosting companies? Enter any other Web Hosting company and we will give you a side-by-side comparison.